Blockchain could help avoid the situation where centralised platforms come to control service provision and data leading to minimal competition. Mobility as a Service (MaaS) is a new business model that is gaining traction in the transport sector—it has the potential to change how we travel. Instead, it could facilitate a decentralised network of transport operators by providing built-in trust, consensus and immutability in data and information sharing. Passengers could also have greater control over their personal data. Mobility as a Service (MaaS) is a new business model that is gaining traction in the transport sector, and has the potential to change how we travel. There are many visions for MaaS, but most include a usership-based, personalised, end-to-end transport service, via any mode(s), with hassle-free digital payment, ticketing, journey planning and management. Proponents see MaaS as having the potential to enable more efficient use of transport systems, which is of particular interest to policy-makers. Consumer demand for MaaS is being driven by several trends, including the desire to move from a model of ownership to a model of usership. This trend is now impacting the transport sector with innovators providing consumers with on-demand access to road vehicles and bicycles. Blockchain represents an opportunity to mitigate against centralised platform issues, with open, transparent and decentralised principles. It could shape new markets in new ways and push MaaS innovation in a different direction. The realisation of MaaS benefits will depend on the interplay between the centralised platform economy, the decentralised blockchain economy, and policy and regulation (on a local and global scale). 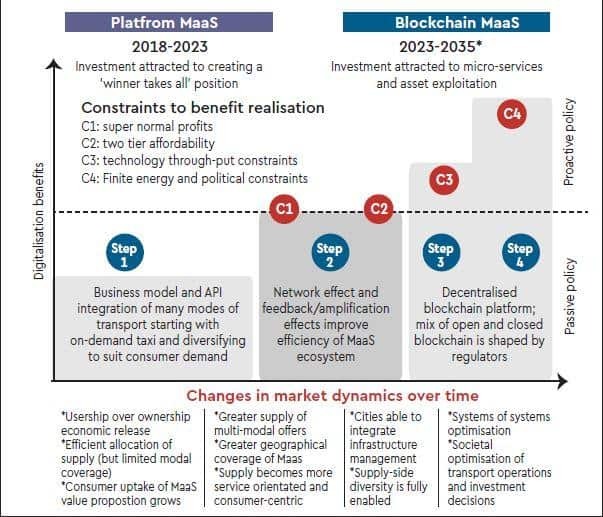 The accompanying chart illustrates how the MaaS ecosystem could develop over the coming years. In the accompanying chart, the constraints C1 and C2 represent potential states of perceived market failure resulting from dominant centralised platforms. In this scenario, socio-political concerns result in policy-makers moving from a ‘watch and wait’ passive policy management position, to a more proactive approach to shape MaaS markets to realise greater digitalisation benefits. C3 and C4 are the theoretical constraints on realising additional digitalisation benefits. These constraints are technical constraints associated with the scenario where the distributed ledger technology services cannot fully satisfy market demand (C3) and where ultimately supply of mobility is constrained by finite economic resources; for example, energy and land availability as supplied by future political frameworks (C4). Blockchain use cases for the above include: decentralised ride hailing, decentralised MaaS network, supply chain traceability, national maritime single window system. The report also suggests that blockchain could help integrate autonomous drone fleets into the existing transport network, without the need to establish large regulatory organisations to track and monitor use and licensing. Connected and autonomous transport systems (CATS) can contribute to increasing the efficiency and safety of the transport system. Road, aviation, water-borne and rail-based systems are at different stages of development and implementation, in terms of technology, regulation and supporting infrastructure. Blockchain looks set to influence all the four areas of CATS significantly. Road-based systems have received the most attention over the past few years; however, autonomous unmanned aircraft systems (UAS) arguably have the potential for the greatest impact on society. This is due to the untold and untapped capacity in low-altitude airspace, combined with a new mode of travel. So, how could blockchain technology and autonomous drones merge in the coming years? Small autonomous UAS or ‘drones’ for carrying freight or passengers for civil or humanitarian purposes are currently in prototype and demonstrator phases, with Google co-founder Larry Page and Daimler investing in ‘flying-car’ start-ups. Autonomous drone delivery of blood samples in Rwanda, began in 2016, is among the first commercial tests. Significant regulatory and technological progress is required before commercial deployment. For the realisation of ubiquitous autonomous drone transportation, an unmanned aircraft system traffic management (UTM) is required. The major underlying components of a future UTM are expected to include a vehicle registration system, electronic identification, communication technologies, integrated air traffic control and airspace classification system (i.e. geofencing). These systems will need to provide the necessary data exchange and control mechanisms—at a high rate and with a high level of integrity. This is where blockchain features could be beneficial—including consensus and transparency throughout distributed UTM networks and immutable recordings of actions. Next article Are we getting close to an all-electric future when it comes to car ownership in the UK?